Tiles, number racks, odd and even pieces. 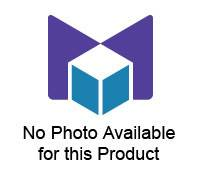 The Number Rack, also known as a Rekenrek or Math Rack, is a manipulative used for elementary math. This Student Number Rack Kit includes all the materials required to build ten student number racks—10 matte boards, 20 pipe cleaners, and 100 beads of each color. Assembly instructions included. These brightly colored, 1 inch tiles help student visualize many mathematical ideas, such as patterning, measurement, counting, and multiplication. Made of 0.5 cm thick plastic; 100 each red, blue, green, and yellow. Includes 400 tiles. 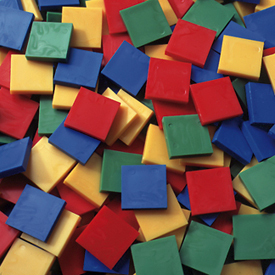 These brightly colored, 1 inch tiles help students visualize many mathematical ideas, such as patterning, measurement, counting, and multiplication. Made of .25 in thick wood; 100 each red, blue, green, and yellow, 400 pieces in total. Nine sets of 28 dominoes each. Nine colors. Colors may vary. Three sets of different colors. Each set includes 55 dominos for a total of 165. Colors may vary. 1 inch red, blue, green, and yellow squares. Soft, high density, 2 mm foam with magnetic backing. 15 of each color; 60 pieces in total. Actual product may vary slightly from picture above. Latex free. Kit includes all the materials needed to build ten student bead strings—100 white beads, 100 red beads, 10 black pipe cleaners. Assembly instructions included.